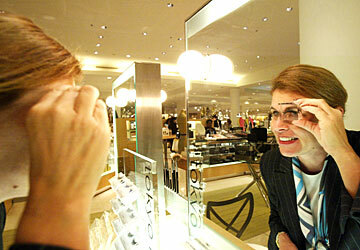 Lucy Chelini, head of public relations for Neiman Marcus in Ala Moana Center, tries on one of Shu Uemura's transparent "lash fitters," meant to go over the eye to check for color, length and fit before committing. Hey, party girl! Sometimes, mascara isn't enough to call attention to those beautiful baby blue or mysterious brown eyes. With all the metallic shine and jewel-toned shadows coloring the holiday season, your eyes need a proper frame to prevent them from vanishing like tiny pinholes. If you can afford lash extensions, great. But for a quicker, inexpensive fix, there's no shame in falsies. You can still get Bes' Kine, just like you did in the 1970s, at Longs Drug, for less than $3. That's if you want 'em in basic black or brown. Over at the Tokyo Lash Bar by Shu Uemura at Neiman Marcus, you can choose from a range of eyelash styles to suit your personality, from demure but enhanced natural tapered 501s, to colorful club-queen pink, electric blue and fiery orange lashes, to showgirl-spirited white feathers to match the season's frosty snow-princess glamour. The lashes range from $12 to $25, and if you're headed to a party, there's no charge for application, though you also have to pay for the glue, at $5. Madonna hits the stage in Uemura's diamond-studded mink lashes that cost a cool $10,000, but coming back down to earth, the rhinestone-studded, synthetic-hair version will cost $25. Uemura's lashes come in an array of colors, including "Slant Red," left, and "Dazzling Diamante," which pop star Madonna uses -- in a mink-and-diamond version -- exclusively on tour. 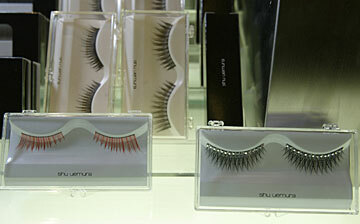 Also available at the Uemura counter are no-pinch eyelash curlers designed to work for the flatter Asian eye. Dior offers one of the most creative new products of the season, in the form of Diorshow IcePearl mascara. Touch the wand to the tip of your lash to release a liquid gel bead that in the right light looks like a glistening pearl or crystal. It does take some patience to achieve the proper look, and it might be better to use it on false eyelashes, which are more evenly spaced than natural lashes. It looks great when all the beads are lined up. When they're not, people could mistake your "gems" for tears of joy. Diorshow IcePearl mascara is $23 at Sephora and the Dior boutique at Ala Moana Center. As a finishing touch, cover your lash line with M.A.C's Fluidline gel eyeliner ($13.50), which goes on smoothly and easily, fast or slow, so that even the artistically challenged can achieve a perfectly straight line. The eyeliner colors include a deep purple "Macroviolet," electric blue "Royal Wink" and lavender "Iris Eyes." The smudgeable colors can go on as thin or thick as you want for the extreme cat-eyed look of past kohl-eyed screen sirens Sophia Loren and Elizabeth Taylor. "There's a lot of '50s influence in fashion right now, so you see that the '50s eye is back," said M.A.C senior makeup artist Victor Cembellin, who's amazed at the results women got at that time with their primitive tools. "It was like every day was prom in the '50s, like doing your most complicated special-occasion makeup and doing it every day." Hallelujah for innovation and accessible glam.